Bird Hunting in Argentina - Uruguay - Testimonials by Los Gauchos Clients. "These guys are great duck hunting guides! Uruguay duck hunting is some of the best duck hunting I have ever seen." hunting trip —and they did not disappoint. There are now over 6,000 hunters that make the trip for Argentina dove hunting every year, and most hunters shoot over 1,500 birds on a three day trip. I thought the population would have decreased since my first trip in 1987, but I shot more birds last November than ever before. The dove volume is Cordoba is amazing!" Hunting in Uruguay is spectacular. It reminds me of the old days growing up on the prairie." Great duck hunts are standard in Uruguay. A soft afternoon would be more than a few North American limits, and the mornings-forget about it!" Dove hunting in Argentina was a great vacation for the whole family. The high volume Argentina dove hunting never let up in the action. The birds flew all day. This is a regular Spring Break trip now." "Los Gauchos is tops for Argentina bird hunting!" 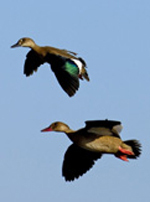 Urugauy duck hunting is a fantastic way for an obsessed duck hunter to get two seasons per year. At my age, there is no certainty for a next season any more, so I don't put it off anymore; I hunt every chance I get." Shooting doves in Cordoba is the most fun you can have with shotgun. We even knocked down a few Picazuro pigeons on the hunt." Los Gauchos Outfitters assists with planning and providing itineraries for South America bird hunting. More than shooting a gun or reaching your limit, hunting trips to South America are about the good ole days of bird hunting, home cooking, and a warm culture that moves at a peaceful pace.